Bangalore: The new 10.8 kilometre Chenani-Nashri tunnel in Jammu & Kashmir, the longest highway tunnel in Asia, will feature a state-of-the-art ABB ventilation system to ensure that users have access to fresh air as they drive through it. ABB India has partnered with IL&FS Transportation Networks Ltd. and Sterling & Wilson Ltd. in the development of yet another major Indian infrastructure project. ABB’s technology sits at the heart of some of the world’s most complex and advanced infrastructure. ABB built the world’s most powerful ventilation system for Gotthard Base Tunnel in Switzerland, which opened to the public in December 2016. It is the world’s longest (57 kilometres) and deepest (8,000 feet maximum depth) train tunnel. From measuring devices in London Tower Bridge to the London Underground to the Statue of Liberty and Burj Khalifa, ABB technologies have been a part of landmark projects around the world. In case of the new Chenani-Nashri tunnel, it will reduce the distance between state capitals by 30 km while ensuring safe and swift passage for commuters, even in adverse weather conditions. 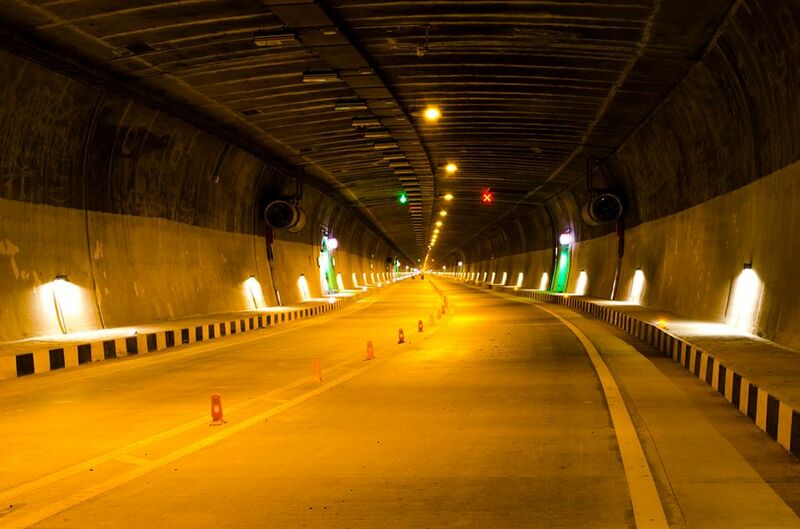 This tunnel is the India’s first and the world’s sixth road tunnel with a transverse ventilation system enabled by ABB drives and controlled by ABB software. For such long tunnels, ventilation systems are essential to maintain clean air, permissible carbon dioxide levels and expel harmful vehicle emissions. To ensure smooth travel and safety of commuters, ABB has designed, engineered and supplied low harmonics variable speed drive (VSD) system for tunnel ventilation. The VSDs and motors are installed at the North (Nashri) and South (Chenani) portals for air supply and exhaust. These VSDs are also equipped with inbuilt redundancy to ensure minimum downtime. The Chenani-Nashri tunnel, at an altitude of 1,200 meters, is a part of National Highway Authority of India’s (NHAI’s) project between Jammu and Srinagar, along National Highway 44. The existing route between the towns of Chenani and Nashri passes through Patnitop and is prone to heavy snowfall and avalanches leading to frequent roadblocks and unsafe travel. “Technologically this is one of the most advanced road tunnels built in the country, surmounting challenges of terrain and distance. We are proud that ABB technologies will save time and costs for the people of Jammu & Kashmir,” said Subir Pal, President, Robotics and Motion, ABB India.